La Maddalena is the biggest of the seven islands of the homonym Archipelago (Caprera, S. Stefano, Spargi, Budelli, S.Maria, Razzoli, and others islets), known for long time as the “Caribbean of the Mediterranean sea”. The transparency and the tones of the sea and the beauty of its beaches and granitic coasts make it an exceptional place. Summer is not the only season to visit us: La Maddalena, Caprera and the other islands are heavens for 365 days a year. For this room we have selected the typical colour of the vegetation of this island that is shaped by the wind. You can also find some characteristic “murales”, hand painted walls that represent the main features of the island: the gull, the sea, the fishermen with their nets and a magnificent view of “Monti della Rena”, one of the most beautiful beaches of the island. 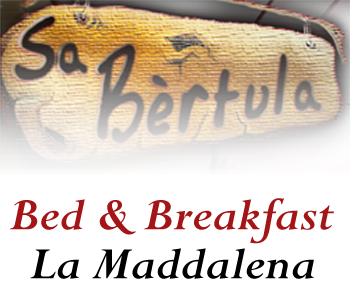 The double Room ” LA MADDALENA” with private bathroom, is a welcoming room. The green of the walls remind us of the Sardinian myrtle plants of the rich Sardinian vegetation. The room has a cabinet, two handmade bedside tables of chestnut, a small chest, a candelabrum of beaten iron, a bracket lamp of wood and cane and some giant pictures of La Maddalena island. There are also a colour TV and heating. The private bathroom has a bidet, a sink, a toilet and a shower in the same style as the bedroom: green walls and wood frames.